Start off your visit on the 26th (Fri): admire the masterpieces at Pinacoteca di Brera, then take in the spiritual surroundings of Duomo di Milano, and then get lost in a book at Pinacoteca Ambrosiana. Get ready for a full day of sightseeing on the 27th (Sat): contemplate the long history of Chiesa di San Maurizio al Monastero Maggiore, then step into the grandiose world of Castello Sforzesco, then stroll the grounds of Monumental Cemetery, and finally admire the striking features of Galleria Vittorio Emanuele II. To find reviews, ratings, where to stay, and tourist information, use the Milan trip planner. Singapore, Singapore to Milan is an approximately 15.5-hour flight. You can also do a combination of flight and train; or do a combination of bus and flight. You'll gain 7 hours traveling from Singapore to Milan due to the time zone difference. Prepare for little chillier weather when traveling from Singapore in July: high temperatures in Milan hover around 34°C and lows are around 21°C. Cap off your sightseeing on the 27th (Sat) early enough to catch the train to Turin. Kick off your visit on the 28th (Sun): examine the collection at Museo Nazionale del Cinema, then take an in-depth tour of Museo Nazionale del Risorgimento, and then explore the world behind art at Egyptian Museum of Turin. To find where to stay, ratings, and other tourist information, use the Turin itinerary maker website . You can take a train from Milan to Turin in an hour. Other options are to drive; or take a bus. Expect little chillier weather when traveling from Milan in July: highs in Turin hover around 30°C, while lows dip to 21°C. Wrap up your sightseeing on the 28th (Sun) to allow time to travel to Rio Marina. Rio Marina is a comune (municipality) in the Province of Livorno in the Italian region Tuscany, located on the island of Elba.HistoryThe first traces of settlements in the area date to the 15th century. Start off your visit on the 29th (Mon): kick back and relax at Spiaggia di Barabarca, then get some jogging in at Spiaggia di Schiapparello, and then kick back and relax at Spiaggia Luisi d'Angelo. To find more things to do, other places to visit, ratings, and more tourist information, go to the Rio Marina day trip tool . Explore your travel options from Turin to Rio Marina with the Route module. Expect a daytime high around 33°C in July, and nighttime lows around 24°C. Finish your sightseeing early on the 29th (Mon) so you can travel to Campo nell'Elba. On the 30th (Tue), kick back and relax at Spiaggia delle Tombe, enjoy the sand and surf at Spiaggia di Cavoli, and then enjoy the sand and surf at Spiaggia di Cavoli. To see photos, reviews, traveler tips, and more tourist information, refer to the Campo nell'Elba trip itinerary planning tool . Traveling by car from Rio Marina to Campo nell'Elba takes 1.5 hours. In July, plan for daily highs up to 33°C, and evening lows to 24°C. Wrap up your sightseeing on the 30th (Tue) to allow time to travel to Cinque Terre. Start off your visit on the 31st (Wed): tour the pleasant surroundings at Beach Bar Alga, kick back and relax at Spiaggia di Fegina, and then appreciate the extensive heritage of Borgo Storico di Corniglia. To find reviews, more things to do, ratings, and more tourist information, you can read our Cinque Terre vacation planner. Traveling by combination of ferry and car from Campo nell'Elba to Cinque Terre takes 4.5 hours. Alternatively, you can do a combination of ferry and train. In July, daily temperatures in Cinque Terre can reach 35°C, while at night they dip to 21°C. Finish your sightseeing early on the 31st (Wed) so you can drive to Assisi. On the 1st (Thu), contemplate in the serene atmosphere at Basilica di Santa Maria degli Angeli - Porziuncola, see the interesting displays at Museo della Porziuncola, appreciate the extensive heritage of Piazza Superiore di San Francesco, take in the architecture and atmosphere at Basilica inferiore di San Francesco d'Assisi, then contemplate the long history of Basilica di Santa Chiara, and finally learn about winemaking at Tili Vini Societa Agricola. Keep things going the next day: explore the historical opulence of Rocca Maggiore, explore the ancient world of Museo Diocesano e Cripta di San Rufino, delve into the distant past at Roman Forum and Archaeological Museum, then take in the spiritual surroundings of San Damiano, then contemplate in the serene atmosphere at Eremo delle Carceri, and finally contemplate in the serene atmosphere at Santa Maria delle Rose. To find photos, where to stay, traveler tips, and tourist information, refer to the Assisi trip planner. Traveling by car from Cinque Terre to Assisi takes 4.5 hours. Alternatively, you can take a train; or take a bus. In July in Assisi, expect temperatures between 37°C during the day and 20°C at night. Cap off your sightseeing on the 2nd (Fri) early enough to go by car to Rome. Start off your visit on the 3rd (Sat): contemplate the long history of St. Peter's Basilica, appreciate the extensive heritage of Piazza Navona, then steep yourself in history at Roman Forum, then admire the local landmark of Trevi Fountain, and finally admire the landmark architecture of Pantheon. Here are some ideas for day two: admire the masterpieces at Galleria Borghese, explore the ancient world of Catacombe di San Callisto, then contemplate the long history of Colosseum, and finally contemplate the long history of Palatine Hill. For ratings, maps, where to stay, and other tourist information, go to the Rome trip builder . Traveling by car from Assisi to Rome takes 2.5 hours. Alternatively, you can take a train; or take a bus. Traveling from Assisi in August, expect somewhat warmer with lows of 24°C in Rome. Finish your sightseeing early on the 4th (Sun) to allow enough time to take a train to Florence. 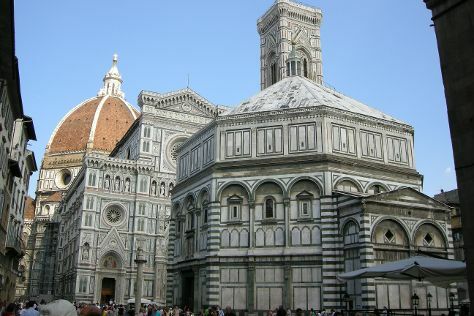 On the 5th (Mon), pause for some photo ops at Monumento a Dante Alighieri, get engrossed in the history at Basilica di Santa Croce, take some stellar pictures from Piazzale Michelangelo, appreciate the extensive heritage of Piazza del Duomo, then take in the spiritual surroundings of Cathedral of Santa Maria del Fiore, and finally take in panoramic vistas at Campanile di Giotto. Keep things going the next day: see the interesting displays at Academy Of Florence Art Gallery, then take in the views from Ponte Vecchio, then admire the masterpieces at Uffizi Galleries, and finally see the interesting displays at Pitti Palace. For other places to visit, reviews, traveler tips, and tourist information, use the Florence vacation planning site . You can take a train from Rome to Florence in 2 hours. Alternatively, you can drive; or fly. Traveling from Rome in August, Florence is slightly colder at night with lows of 20°C. Wrap up your sightseeing on the 6th (Tue) to allow time to take a train to Padua. 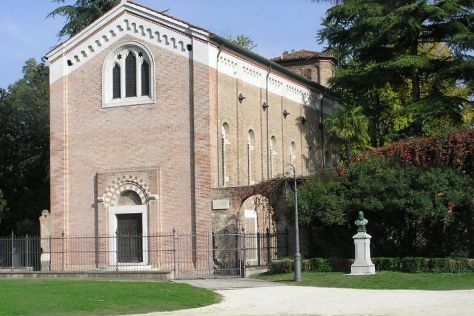 On the 7th (Wed), pause for some serene contemplation at Basilica di Sant’Antonio, take in the spiritual surroundings of Scoletta del Santo, take in the spiritual surroundings of Oratorio di San Giorgio, contemplate in the serene atmosphere at Scrovegni Chapel, then take in the spiritual surroundings of Chiesa degli Eremitani, and finally take in the spiritual surroundings of Parrocchia San Nicolo. To find traveler tips, more things to do, photos, and more tourist information, read our Padua route planner. Getting from Florence to Padua by train takes about 2 hours. Other options: drive; or take a bus. Expect slightly colder weather when traveling from Florence in August: highs in Padua hover around 32°C, while lows dip to 24°C. Wrap up your sightseeing on the 7th (Wed) early enough to take a bus to Venice. Kick off your visit on the 8th (Thu): contemplate the waterfront views at Canal Grande, pause for some serene contemplation at Basilica di San Marco, then admire the masterpieces at Peggy Guggenheim Collection, and finally steep yourself in history at St Mark's Campanile. 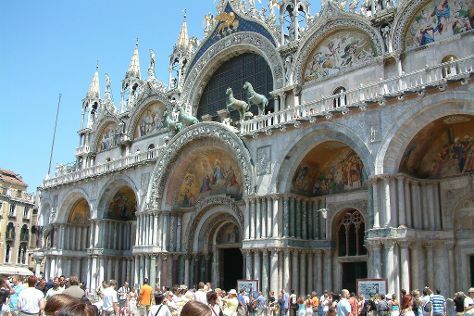 Here are some ideas for day two: admire the masterpieces at Gallerie dell'Accademia, admire the landmark architecture of Doge's Palace, and then make a trip to St. Mark's Square. To see maps, where to stay, other places to visit, and tourist information, refer to the Venice trip planner . Venice is just a short distance from Padua. August in Venice sees daily highs of 34°C and lows of 22°C at night. Finish up your sightseeing early on the 9th (Fri) so you can go by car to Ljubljana. On the 10th (Sat), take in the spiritual surroundings of Cathedral of St. Nicholas (Stolnica Sv. Nikolaja), then take a stroll through Ljubljana Old Town, then test your team's savvy at Ljubljana Castle, and finally contemplate in the serene atmosphere at Franciscan Church (Franciskanska cerkev). To find more things to do, where to stay, traveler tips, and more tourist information, refer to the Ljubljana day trip planning app . You can drive from Venice to Ljubljana in 2.5 hours. Alternatively, you can take a bus; or do a combination of train and bus. Prepare for a bit cooler weather when traveling from Venice in August: high temperatures in Ljubljana hover around 31°C and lows are around 15°C. Finish your sightseeing early on the 10th (Sat) to allow enough time to travel back home.